This issue is devoted to a new talent: Brett Greene. Nebula is intentionally an ‘unperiodical’—which frees me, as editor, from deadlines and leaves me free to pursue my own work, while still allowing me to promote the works of others whom I admire. But still it’s been a long while since I’ve had the time, inclination, or—most importantly—received sufficiently interesting submissions, to wake Nebula (AKA me) from a rather excessively long hibernation. I’ve been around the block when it comes to dealing with young, unpublished, would-be poets, and I can count on the fingers of one hand the number who have handed me manuscripts that I immediately thought really had it. (‘It’ being the truly individual and distinctive voice, the rare commitment to effective use of language, and the deep and subtle feeling that distinguishes the real poet.) And I’m proud to say that my judgement has panned out in every case. So I expect to stay on a roll with publishing this young man’s work. Copyright remains with him, and I hope this exposure will find him outlets with a wider readership—and may eventually lead to book publication. Brett Greene says he writes of “the dire, shady, illicit folks you’d find in the seedy underbelly of post-Victorian literature—pulp fiction, comics, tone poems and case studies.” He admits to Tom Waits and Ferlinghetti as influences, but also T.S. Eliot and Dennis Lee. (One could find worse influences!) He says of these poems that they “are meant to be heard”, and while text on the page (or the computer monitor screen) is not heard (unless the reader knows, and follows, the dictum that poetry should be read aloud) his concern with the sound of his words is evident—and admirable and effective. 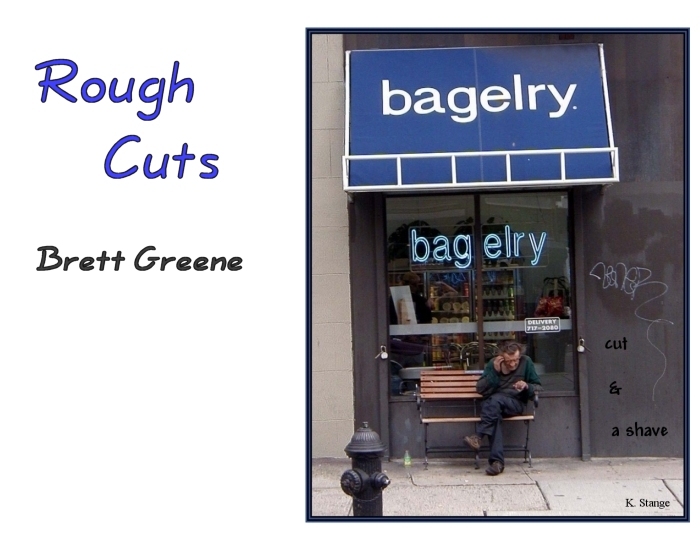 This selection of Brett Greene’s work is his “Selected Poetry” from the last five years. It is unedited—in accordance with Nebula’s policy to accept or reject the whole enchilada. “Rough Cuts”, the title I’ve given this selection, this issue, is mine. It seemed appropriate given Greene’s interest in film, the jagged cuts some of these poems make in one’s emotional skin, and the fact that some these are very rough around the edges—and often more effective because of this. So, dear reader, get ready for a rough ride. This is the real stuff.